The UN Resident Coordinator and UNDP Resident Representative in Ukraine Neal Walker during the meeting with the Head of Donetsk oblast state administration Oleksandr Kikhtenko assured that citizens of Donetsk will receive UN support. “We will increase the size of such support” ,underlined Mr. Walker. The representatives of UN mission also informed public that they are ready to launch the implementation of the Third phase of joint EU/UNDP Project “Community Based Approach to Local Development” Project (CBA) in Donetsk oblast. In terms of the Third phase of CBA Project USD 350,000 will be allocated for the next 3 years. During the meeting the parties also agreed that international organisations and development agencies play significant role in peace building in the East of Ukraine. As it was mentioned by Oleksander Kikhtenko, today rural areas of the region require special support. Thus oblast authorities will fully support implementation of the Third Phase of CBA project in rural areas. 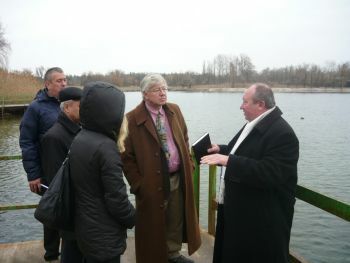 Mr. Neal Walker also visited health centre “Sloviansky”, which is in Donetsk oblast. As of today the health center has accommodated around 100 people with serious health problems, out of them 35 people came from occupied territories. Many things were stolen from the health centre – such as bedclothes, equipment, TVs etc. The building of the centre was damaged under fire. To quickly address the needs of Donetsk oblast, the UNDP office will be established in Kramatorsk in the nearest future. UNDP together with European Union support Donetsk oblast since March 2009. During two phases of CBA Project around 140, 000 people improved their living conditions through implementation of microprojects aimed to restore 78 kindergartens and schools, 15 health posts, 8 water supply systems and access to fresh water, 8 street lighting energy efficient systems.